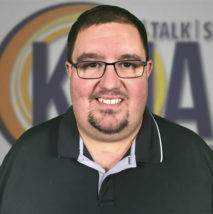 Brandon comes to Manhattan Broadcasting as a new face to the community and was named News Director in October 2018. His career spans close to a decade in broadcasting doing broadcast news with stations in Emporia and Hastings, Nebraska. He also worked as a sports director in Broken Bow, Nebraska. He received an Honorable Mention award from the Kansas Association of Broadcasters in 2018 for his “year in review” news special program focused around the devastating 2017 summer water main break in Emporia. Brandon has interviewed many political, sports and inspirational figures and says his favorite interview was with Marlin Briscoe, who became the first African American professional football quarterback. A Kansas City native, Brandon roots for the Royals and Chiefs and was born the year the Royals won their first World Series (1985) and was thrilled when they returned to the World Series in 2014 and won it all in 2015. He’s also perhaps among the few Utah Jazz fans in Kansas having lived in Idaho as a child growing up watching John Stockton and Karl Malone. When he’s not working, Brandon enjoys spending time with his wife Heidi and two daughters, Lorelei and Selena. The family enjoys traveling and is always up for a good zoo or museum and catching a new movie or live music whenever possible.